Home Tags Posts tagged with "ron woodroof"
Ron Woodroof was first diagnosed with AIDS in 1985 and given just 30 days to live. 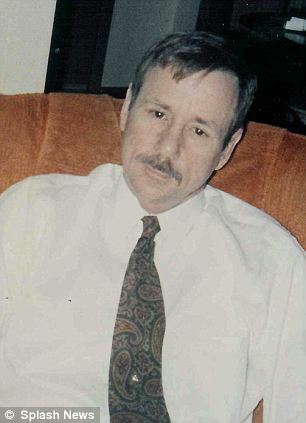 Ron Woodroof, who was born in Texas in 1950, was 35 at the moment of diagnosis. He became an electrician and rodeo cowboy in adulthood. Ron Woodroof initially refuses to accept the diagnosis, but remembers having unprotected s** with an intravenous drug-using prostitute. 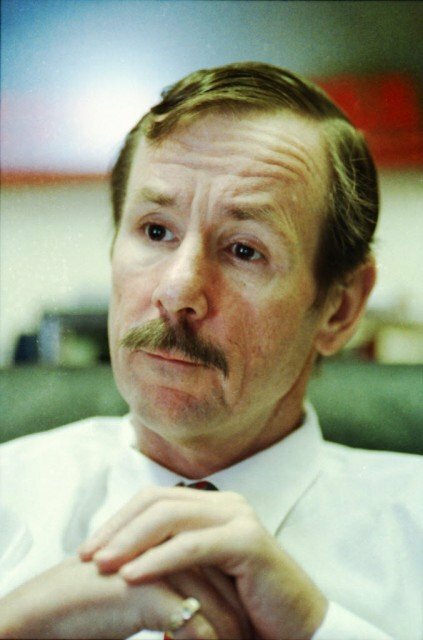 Instead of accepting the death sentence, Ron Woodroof studied the disease and its effects on the body, and created a business sourcing and smuggling non-FDA approved medication, experimental and alternative drugs for AIDS patients. His determination and tenacity enabled him to live for six more years – during which time he pushed legislation through the courts, promoted awareness of the disease and helped countless other AIDS patients in the process. In 1988, Ron Woodroof also began what is now known as the Dallas Buyers Club, through which he sold the drugs to AIDS victims around the world who had no other recourse. In the face of the FDA and other regulators, the Dallas Buyers Club flourished, but Ron Woodroof himself succumbed to the affliction six years after the diagnosis, on September 12, 1992. Through the Buyers Club, Ron Woodroof operated a large distribution center for experimental AIDS treatments out of his Oak Lawn, Texas, apartment, selling thousands of dollars worth of medication. His club resulted in a huge network of buyers and sellers, all of whom attempted to fly under the FDA radar. The group imported AIDS treatments from other countries or smuggled in experimental American drugs that had been shipped to other countries but were not approved in the US. His fight brought added awareness to the disease, and the awareness in turn helped countless victims find Ron Woodroof and attain a level of help otherwise unavailable. More than two decades after his death, Ron Woodroof and his story are gaining renewed attention in 2013, as a movie version of his life, Dallas Buyers Club, finally came to fruition after years in limbo. The film stars Matthew McConaughey as Ron Woodroof, a role which brought him the Academy Award for Best Actor prize last month. Matthew McConaughey lost 30 lbs for the role. Matthew McConaughey shed 40 lbs to play the role of HIV positive Texan Ron Woodroof in highly anticipated film Dallas Buyers Club. The results of Matthew McConaughey’s dramatic transformation are shockingly clear in a new trailer for the film. Matthew McConaughey, 43, shows off his range in the preview footage, appearing tearful, angry and frustrated as he attempts to smuggle life-prolonging drugs into the U.S.
Dallas Buyers Club, set in 1985 Dallas, begins in the doctor’s surgery with Matthew McConaughey’s Ron Woodruff being informed he has tested positive for the HIV virus. “Have you ever used intravenous drugs? Have you ever engaged in homos**ual conduct?” the doctor asks the initially homophobic electrician. “You made a mistake. Because that ain’t me,” a horrified Ron Woodroof replies. After being told he has 30 days to live, Ron Woodroof determines to find a way to survive. “There ain’t nothing out there that can kill Ron Woodroof in 30 days,” he declares. Ron Woodroof turns to Jennifer Garner’s doctor Dr. Eve Saks for assistance but is unhappy with AZT, the only conventional drug available at the time. Ron Woodruff then begins bringing the drugs back over the border, initially dressing as a priest and telling customs officials he has “nada” to declare. The trailer then cuts to him encountering Jared Leto’s transgender character Rayon on the street. Jared Leto, who also shed 30 lbs to play the role of the HIV positive transgender, plays the part in sassy yet fragile style. 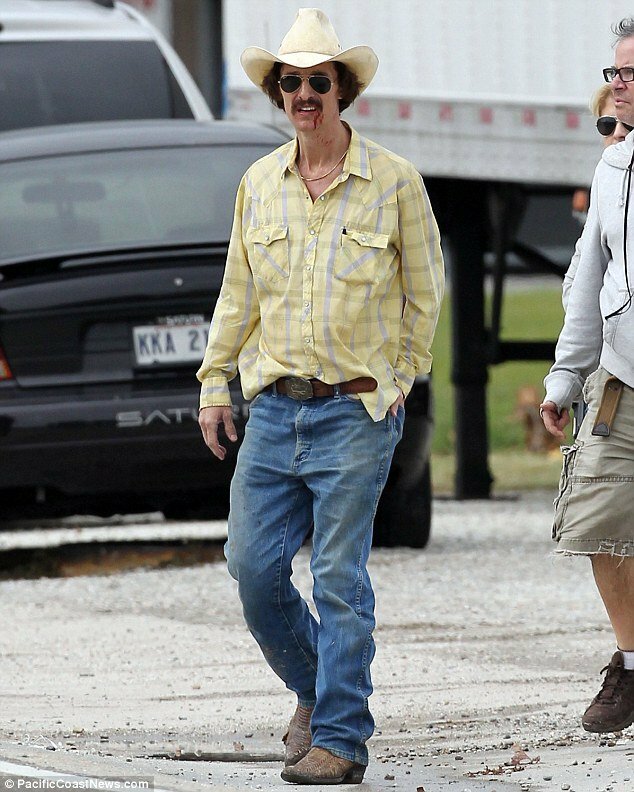 “I’ve been looking for you lone star,” she tells Ron Woodroof after getting into his car, before she negotiates “25 per cent cut” of his burgeoning operation, which he soon names Dallas Buyers Club. The trailer touches on the relationship between Jared Leto and Matthew McConaughey’s characters, with former homophobe Ron Woodroof assaulting a man in a grocery store after he insults Rayon. However, things predictably don’t all go smoothly in Ron Woodroof’s new venture. With an increased number of HIV and AIDS patients seeking his help, he comes to the attention of the FDA who investigate. But Ron Woodruff is clever, giving police a list of members of the club, who happen to share the monikers of the Dallas Cowboys football players. Forced to look further afield than over the Mexican border, the movie shows Matthew McConaughey travelling all over the world in search of supplies. The film also follows Ron Woodroof’s personal quest to survive more than his 30 day prognosis. In reality, he actually managed to live for a further 2191 days, passing away on September 12, 1992, six years after he was diagnosed with the HIV virus. Meanwhile there has been growing Oscar buzz surrounding Matthew McConaughey and Jared Leto’s performances after Tuesday’s first viewing of the trailer which will première at the Toronto Film Festival. Commentators have also cited Focus Features’s decision to move the film’s release date up to November 1, in order to fully maximize its awards season chances. Ron Woodroof’s family helped Matthew McConaughey to reveal the true story of courage that inspired actor’s breathtaking transformation in new movie The Dallas Buyers Club. Sharon Woodroof Braden, 70, and Yvette Carroll, 42, have had years to try to come to terms with the agony of losing Ron Woodroof – Sharon’s brother and Yvette’s father to AIDS. But Matthew McConaughey’s astonishing physical transformation to tell Ron Woodroof’s courageous story in The Dallas Buyers Club means they will soon see his brave battle relived on the big screen. These exclusive photos of Ron Woodroof, who is described as a heterosexual, homophobic electrician, as he fought the disease show just what a remarkable resemblance Matthew McConaughey has achieved for his portrayal. Speaking from her home in Como, Texas, Sharon Woodroof Braden said: “It’s very hard to see. I don’t go on the internet. “It’s hard to look back whenever you’ve lived through it; it’s really hard to look back at something like that. So I don’t look at the pictures that much. “The pictures of Matthew are breathtaking though. They look so like what Ronnie looked like when he was sick and how the disease progressed. “Matthew is definitely looking like he’s gone down that path. His eyes, that is the main thing, the way he is doing his eyes. Ron Woodroof – who Sharon and Yvette affectionately call Ronnie – was an extraordinary character who was diagnosed with AIDS in 1986 and given just six months to live. and its effects on the body, and created a business sourcing and smuggling non-FDA approved medication, experimental and alternative drugs for AIDS patients. “I remember he was the best-looking man I’d ever seen, even when I was little,” his daughter Yvette Carroll has said. Over the years, several A-List stars have had their names attached to play the role of Ron Woodroof in the film – including Brad Pitt and Ryan Gosling. Sharon Woodroof Braden said: “They wanted Brad Pitt to play him and I thought <<No, that isn’t going to work because I didn’t think Brad Pitt had the personality>>. “They talked about Ryan Gosling and I thought the same thing. “I like Ryan Gosling but I didn’t think his personality was the right personality. Sharon Woodroof Braden says the way Matthew McConaughey has gone about losing weight to transform into Ron is another characteristic they shared – determination. The actor has dropped more than 40 pounds for the role leading to criticism that he was risking his health by extreme dieting, though he insisted he was going it the safe and healthy way. “I feel fine. I really do. I got the means to lose the weight in a really healthy way. I’m eating fresh fish. I’m just eating small amounts. I’m not being starved… I’m taking care of myself,” he told The Daily Beast. Of his shocking weight loss Sharon Woodroof Braden said: “I hate that he’s having to do this, I really do. I wish there was another way for him to do it, but that is just another trait – determination – Matthew does to portray someone dying of AIDS. Sharon Woodroof Braden says that things weren’t always easy between her and Ron when he was alive. He was a drug user and had many girlfriends – leaving his family unclear exactly how he contracted HIV. “I will say this, I love Ronnie and always have – and I miss him with all my heart – but I know where he is and I know where my cars are now! Matthew McConaughey revealed he was going to lose a staggering 30 lbs to play real-life AIDS victim Ron Woodruff in upcoming movie The Dallas Buyer’s Club. But it seems that it might be time for Matthew McConaughey to stop his weight loss quest. 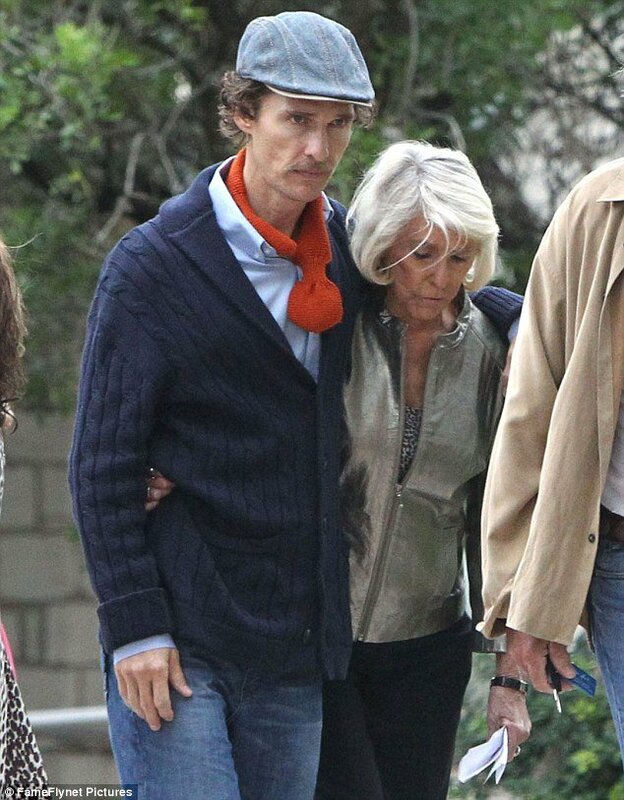 Matthew McConaughey, 42, was seen on a family day out in Austin, Texas, on Sunday, and appeared to be severely emaciated. The actor failed to conceal his frail frame beneath a baggy navy knitted cardigan and loose-fitting jeans, wearing a red scarf around his neck and topping off his outfit with a flat cap. He even appeared to be struggling to walk along, putting his arm around his mother Mary for support as the group left church after the morning service. However, while Matthew McConaughey looked terrifyingly gaunt, his wife Camila looked healthier than ever. The Brazilian model is currently expecting her third child with Matthew McConaughey, and highlighted her blooming figure in a patterned maxi dress, which she finished off with a pair of brown cowboy boots. Camila and Matthew McConaughey were joined by their two children Levi and Vida for the service, with Vida looking cute in a dress and orange scarf, while Levi opted for a dapper outfit in jeans and a mini pea coat. It was revealed last year that Magic Mike star Matthew McConaughey would be playing Ron Woodroof in the upcoming movie, after beating strong competition from stars including Brad Pitt and Ryan Gosling for the role.